Existing Home Sales Rise Again; 'Seller's Market Is Developing,' Realtors Say : The Two-Way Sales were up more than 9 percent from a year ago. Realtors report that across much of the nation, would-be buyers are beginning to outpace the supply of homes. A "for sale" sign in San Francisco last summer. Sales of existing homes rose 0.4 percent in January from December and were up 9.1 percent from January 2012, the National Association of Realtors reports. 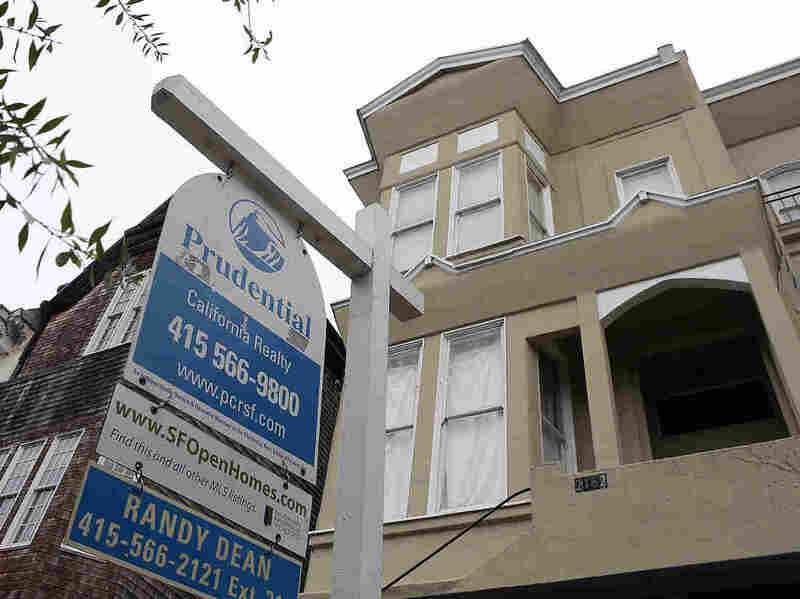 The trade group also says "a seller's market is developing and home prices continue to rise." Bloomberg News writes that the news signals the housing sector is "showing more momentum" after enjoying "its best year since 2007." "Buyer traffic is continuing to pick up, while seller traffic is holding steady. In fact, buyer traffic is 40 percent above a year ago, so there is plenty of demand but insufficient inventory to improve sales more strongly. We've transitioned into a seller's market in much of the country." "Americans remain pessimistic about the economic outlook in February as rising gasoline prices compound the damage done by a higher payroll tax. The gap between positive and negative expectations was minus 7 this month, unchanged from January's three-month low, according to the Bloomberg Comfort Index." Earlier Thursday, there was word that inflation remained in check last month — but that jobless claims rose last week. Also, the Conference Board said its leading economic index rose 0.2 percent in January. That's a sign the economy should keep growing in coming months.